As you continue your outdoor family activities - grilling, picnicking, camping, and hiking - remember to include all natural in shell peanuts since they give you energy and are full of healthful nutrients. Did you know that peanuts are grown in 15 states? The region of Virginia, North Carolina and South Carolina produces Virginia-type peanuts. Pack them in a backpack to eat along the hiking trail, enjoy them in a tent under the stars and snack on them at family picnics. These in shell beauties can be smoked, boiled, roasted or grilled. Meat and vegetables aren't the only foods that are delicious when grilled. How about putting some in shell peanuts on the grill and making your own hickory smoked version? They can be eaten by the handful or used to add flavor and crunch to salads, casseroles, poultry stuffing or other prepared dishes. Or try some homemade boiled peanuts. Boiled peanuts are moist, yet crunchy, and have a mild nutty flavor. Look in your grocery store produce departments, these large kernelled peanuts may be purchased raw, roasted, salted-in shell and seasoned with jalapeño and other flavors. Raw in shell peanuts may be oven roasted, smoked to infuse favorite flavors, and boiled for snacking and to use as an ingredient. Peanuts that are already roasted may be heated in the oven or on the grill for quick "hot roasted peanuts." The pleasing aroma serves as a magnet to draw all to have a taste. They're good when you're on-the-go or when you're at home grilling in the backyard. Here are some new ways to enjoy an old favorite Peanuts Recipes. Soak wood chips for 20 minutes in cold water. Drain wood chips thoroughly. Place wood chips directly over hot charcoal briquettes. Place aluminum foil on the grill rack; make small holes in the foil to allow smoke to flow through. Place drained Virginia-type peanuts on aluminum foil. Cover grill and smoke roast the peanuts for 20 minutes, but keep an eye on the peanuts to ensure even roasting. Turn peanuts over and smoke for another 20 minutes. And turn one more time to smoke for a final 20 minutes. If the peanuts are not fully roasted and crunchy when cooled, put them back on the grill or in a 225° F oven until desired doneness. Roast peanuts while grilling for family picnics and gatherings. Enjoy them as an appetizer or as part of your meal. Place raw in shell peanuts one layer deep in a shallow baking pan. Roast in a 350° F oven 20 minutes for a light roast or 25 minutes for a darker roast. Remove from oven just short of the roast level desired as peanuts continue to cook as they cool. To make "hot roasted peanuts" from purchased already-roasted peanuts, allow to heat in a 250° F oven or on a slow grill for 15 minutes. Once roasted remove from shell and place in bowl with 2 tablespoons of Jake's Southwestern Hickory Dry Rub. Toss peanuts until coated with Dry Rub, remove and eat. Bring the peanuts to a boil; reduce heat to simmer and continue to cook for 4 hours. Test for doneness to see if texture and saltiness are suitable. Add to cooking time in 30 minute increments if softer peanuts are desired. Allow to remain in brine to increase saltiness. Drain as soon as desired texture and degree of saltiness is achieved. Cook soaked peanuts on low for 8 hours, then on high for 1-1/2 hours. Test for doneness; increase cooking time as needed to achieve desired texture and saltiness. When cooked, drain and serve hot as a snack or allow to cool, shell and use the peanut kernels to add flavor and zip to salads and casseroles or dressing to accompany pork, poultry and other prepared dishes. Peanuts not eaten immediately may be stored in the refrigerator for several days. Combine oil, vinegar, soy sauce, honey mustard and dill weed in jar with lid. Shake well. Arrange spinach on plates. Top each plate of spinach with apple, peanuts and cheese. 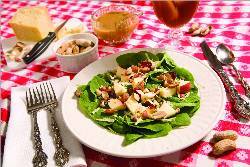 To serve, shake dressing and drizzle over salads. For peanut recipes, visit www.aboutpeanuts.com and www.nationalpeanutboard.org. Produced by ECES and Jake's Famous Foods.